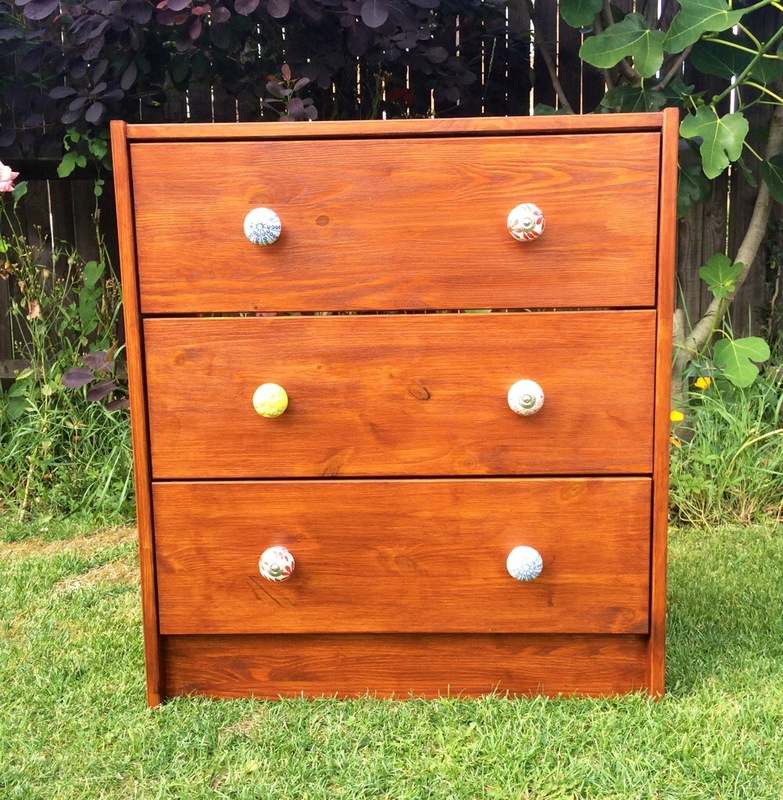 Ikea Rast chest of drawers/bedside table. I believe this is technically known as an IKEA hack. Take a cheapo IKEA basic piece of furniture and make it look a bit less cheap and basic with paint/knobs etc. This is for Martha's new bedroom and kept me busy today before the early school run for end of term. The Rast unit was £20 from IKEA last week. The teak colour woodstain/varnish was from Homebase (chosen to match an existing wardrobe) and I gave it an extra coat of clear on top. 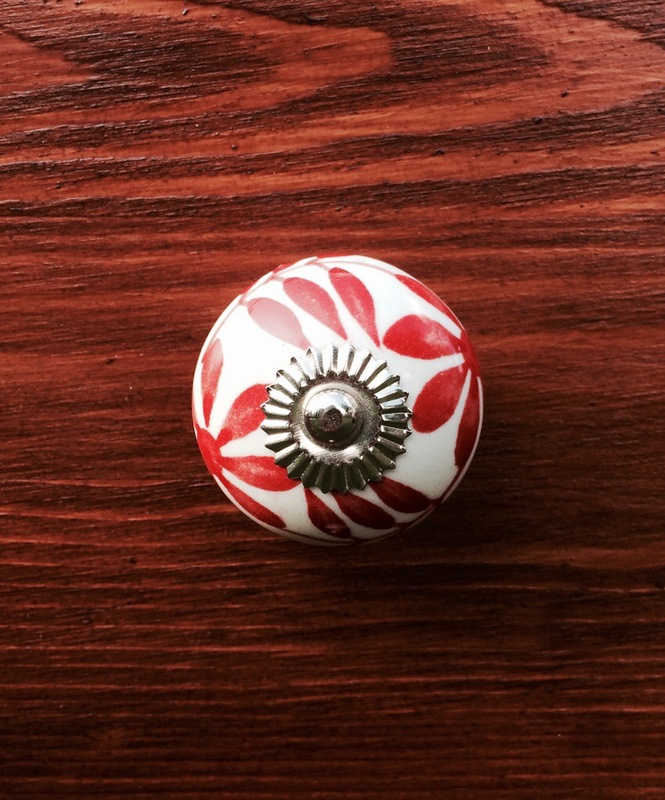 I picked the knobs up in TK Maxx, they were in packs of 4 hand painted vintagey knobs I like the mix and match look of them the wardrobe got some of these as well! The hack involved making the flat pack unit (without the back board and drawer runners) and painting this and the drawer fronts 3 coats of teak varnish then one of clear to seal it properly – I imagine a few bedtime drinks will be spilled over it in the future! Then finishing the drawer build adding the new knobs and adding the runners and backboard to the unit. Can't wait to get it in her new bedroom, but I need to wait for the carpet fitters first. 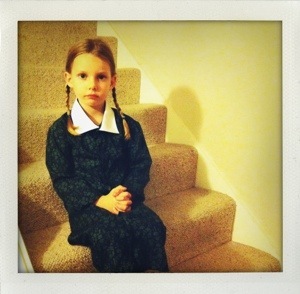 As promised, here is Martha’s Wednesday Addams costume prop, Pubert Addams. The freaky, moustachioed baby brother of Wednesday, who saves the day in ‘Addams Family Values’ the second Addams Family film. 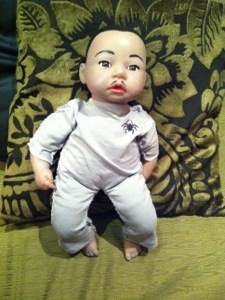 I took a normal baby doll from the charity shop, he had blue eyes originally but I coloured these in with a brown sharpie, gave him a greyish skin tone, by lightly spraying him with a car spray primer, I painted on his hair with black acrylic paint and drew on his eyebrows and ‘tache, with a black sharpie. I added some eyelashes and a pinkish pva glaze to his mouth after a google image search of Pubert revealed a much prettier baby then I had remembered! I made him a baby gro, out of a grey tshirt, I roughly drew round the dolls body, drew a spider on it and stitched it together on the doll. 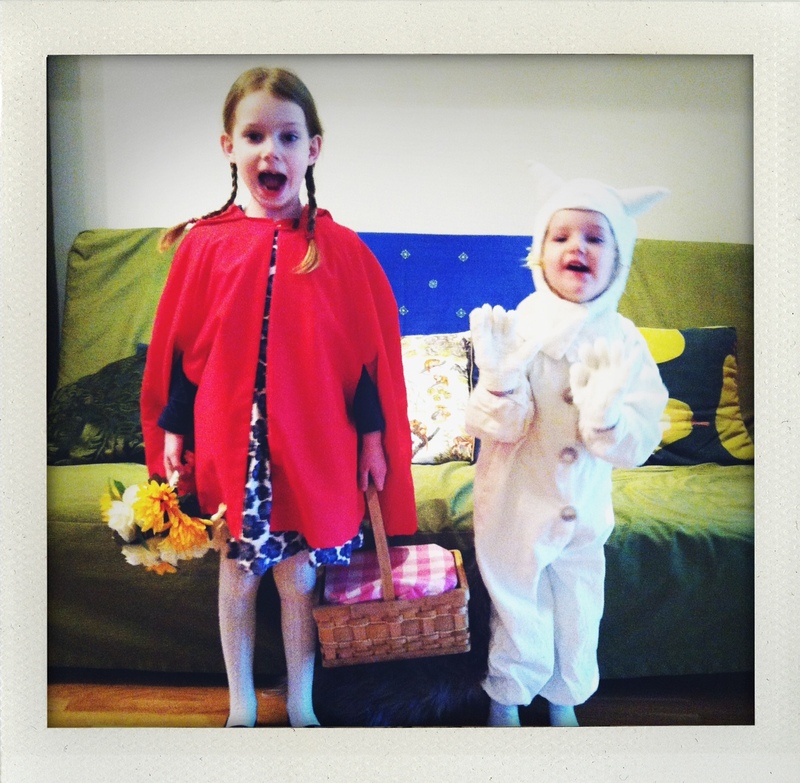 I was going to call this post ‘Wednesday and the Wild Thing’ as I think it would make a great title for a kids book, but Halloween costumes is what they are. 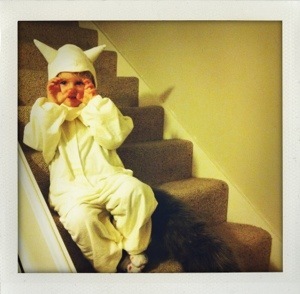 I have wanted to make a Max from the Wild Things outfit for one of my kids ever since I can remember, the wild things was my favourite book when I was little, and fortunately Alice agreed to be a Wild Thing for Halloween this year. 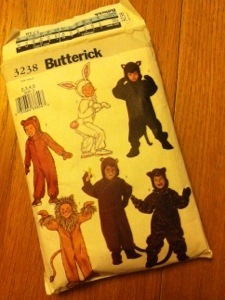 I used a butterick kids costume pattern, (I had used for Martha’s Halloween Pink Cat costume a few years ago). I started with the jumpsuit with a fluffy wolf tail made from cheap furry leg warmers from eBay. The fabric I used was brushed cotton or winciette in off white /cream, to give it more of a vintage feel. I made the hood part plain (no ears) and made and stuffed two triangles which I hand stitched into place. Martha decided she wanted to be Wednesday Addams this year, from the Addams Family films she has recently become obsessed with. So watched it a few times to get a good idea of Wednesday’s outfits. 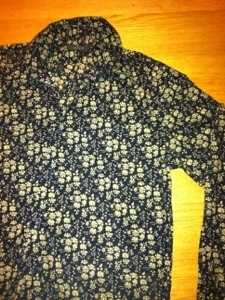 I decided on the classic dark grey floral shirt dress with bright white collar. I managed to find a man’s shirt in the charity shop with a suitable size floral pattern and then dyed it black with a Dylon black hand dye, just dipping it quickly (not for the full 20 mins) before rinsing it out. When it was dry, I cut the collar and the sides of the shirt and sleeves down to the width of a 5 year old, and cut 2 new sleeves out of the old sleeves, then sewed up the sides, attached the sleeves and hemed them. I cut the white collar off and old one of my husband’s and sewed it onto the dress. Easy Peasy! I am painting a charity shop bought baby doll as the moustached baby Pubert Addams, from Addams Family Values, as a prop for Martha and might make Alice a big fork, from the illustration where Max is chasing the Westie Dog. My husband bought me the ‘Iron Ons’ book by graphic designers ‘Sukie’ for christmas – I believe it was from my amazon wish list, but I have seen these for sale (new) in oxfam shops. I have been a big fan of ‘Sukie’ wrapping paper for a while and even have a sheet of their mixed font alphabet paper framed in our stairwell. 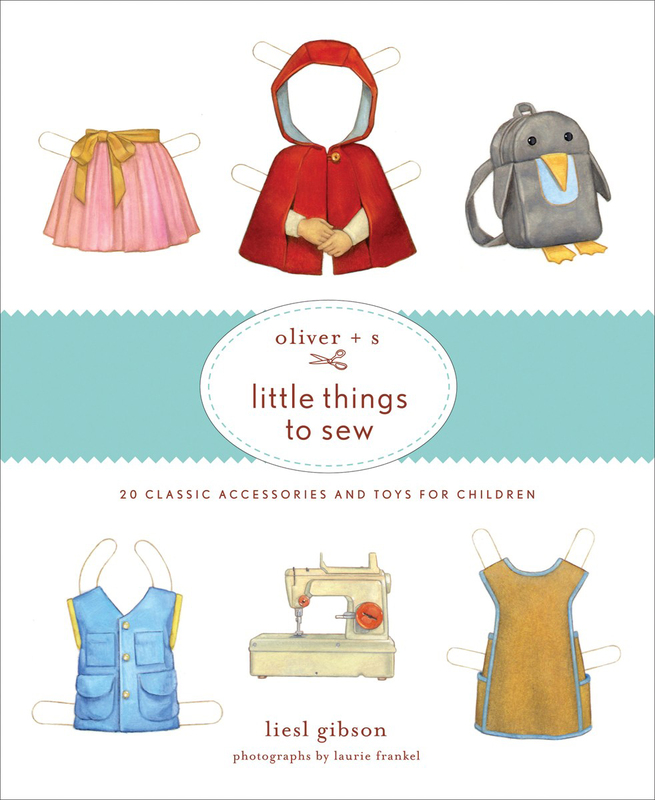 So the opportunity to make some stuff with the quirky cute designs has been very tempting – but not so much that its taken me till March to make use of them! I had planned to upcycle some old t-shirts with the iron ons, but all the girls’ tees seem to be covered in too many stains for sucessful up-cycling, so I had to buy new. I found these 3 packs of plain colour capped sleeve summer tees in tesco, so bought a pack in size 5-6 and another in 2-3, one set for each for Martha and Alice. I let them pick their own images from the book, with a bit of persuasion from me of course. Martha chose the page of pink and khaki butterflies and the ‘princess castle’ with home sweet home on it. Alice liked the animals in the tree which reminded her of her favorite book of the moment – ‘Stuck’ by Oliver Jefferies (firmly recommended by the way). I chose the two half page alphabet designs the same as I have hanging in the stairwell, the colours in these included the same pink and peppermint green as two of the t-shirts in the packs so I put those onto the dark blue ones, the pink butterflies and 3 cute birds on branches went onto the pale green tees and the tree and palace went onto the pink tees. With the planning done I got out the iron, I do most of my iron ons on the kitchen counter as its firm and flat enough to apply some pressure, I am however pretty tall so can stand on my tippy toes and apply a considerable amount of my body weight to the iron during the process, a sturdy kitchen table would work for shorter folks, but be careful not to scald the surface. You have to have the iron on its hottest setting and no steam or water. I have no idea when ‘World Book Day’ is as every school seems to be doing something different every day all through March! 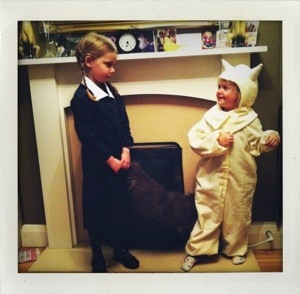 But Martha’s School had a dressing up day on Friday. 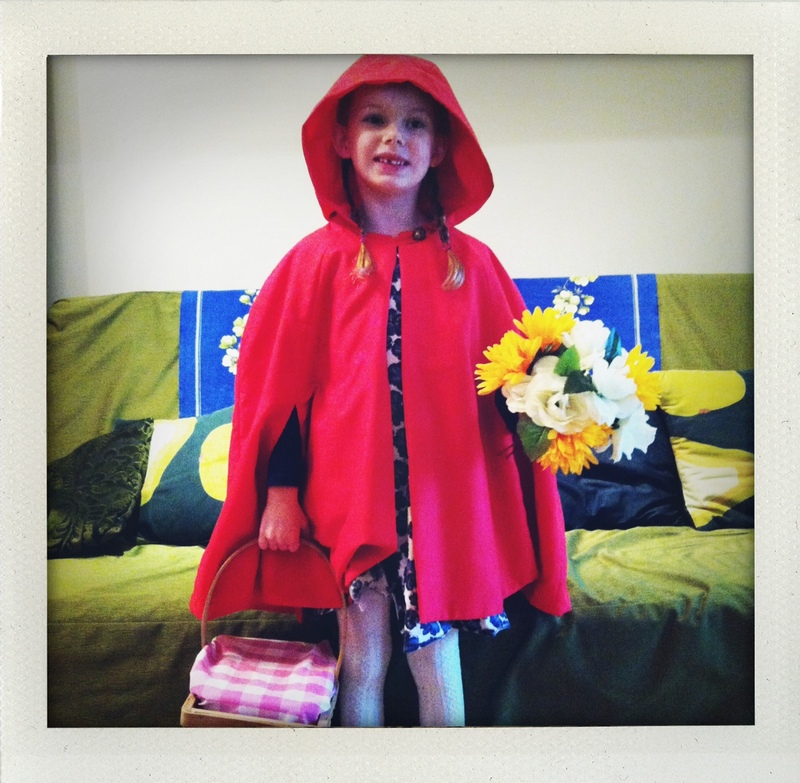 I was reluctant to let her dress up as a disney princess for this one, as they are from films, not books. We settled on the classic ‘The Tiger Who Came to Tea’ by Judith Kerr, whose beautiful illustrations bring the (slightly surreal) story to life. For Sophie’s costume we needed a blue long sleeve tshirt, a Purple A-line pinafore dress, a big Blue Bow for her hair, paintent black shoes and those pink, blue and white harlequin tights. We had the long sleeve blue tshirt, and paintent black school shoes and I made the purple dress out of a pair of purple ladies vests (size 12) from tesco (£2 each in the clothes sale! 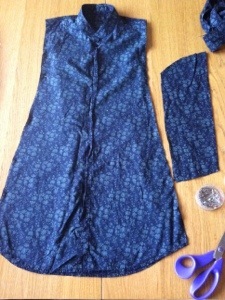 ), – I detached and sewed the two back panels together, as the front panels had a very low neckline for a 5 year old. She had a pair of white tights and a trip to the local haberdashery supplied the big blue ribbon for her hair and a blue and pink pots of dylon fabric paint. I made two forms for the tights by cutting two pieces of card into long ‘leg’ shapes, about 10cms by 60cms with rounded ends at the ‘feet’, I divided the forms up into squares and drew these on with marker pen. Then stretched the tights over them and spent some time painting in each of the squares with the blue and pink fabric paint. I was trying to be a bit thrifty with the paint and so painted them with as little colour as possible, the bonus of this was that they looked more like the rough colouring in Judith’s original illustrations. Then as luck would have it the local oxfam had a soft tiger toy in their sale bin for 50p! He even growl’s when you squeeze his tummy. He is obviously much smaller than the huge, greedy tiger from the story but a good prop nevertheless!